As any computer scientist would tell you, algorithm is king, and whether you are going for a Google interview, or looking to work on a project that optimizes large data, algorithms are the key differentiators that separate mediocracy from greatness. So, ive decided to write a new article on algorithms, firstly as a refresher for my mind, secondly to apply the knowledge with Swift, and thirdly, to promote an excellent book, from which the code comes from, Swift Algorithms & Data Structures, by Wayne Bishop, whom I highly regard, of course. So the first concept you learn when you pick up an algorithm book is, Big O Notation. Its a standard that is used to measure and compare algorithm techniques, which start all the way from linear to logarithmic comparisons. As the speed is dependent on input size, the algorithm is less efficient as input size (n) grows, and is therefore considered to be O(n). As the array is sorted, we can more easily work out whether to search before or after the pointer at each turn, so the performance of this is said to be logarithmic, represented as O(log n). That is, complexity is minimized when size of input grows. OK, so a brief introduction of the Big-O, we take a look at sorting next, and sorting arrays makes it easier for algorithms to search more efficiently. To illustrate visually the different types of sorts, I would recommend this awesome animation site, VisualGo, which explains each of the types step-by-step, supplemented with pseudocode and annotations. Evaluates a constant set of numbers with a secondary set of changing numbers. Outer loop is invariant, assures all values are checked. Inner loop secondary engine reviewing what numbers get compared. Note, I created this function as a generic, so that you can pluck in letters as well. 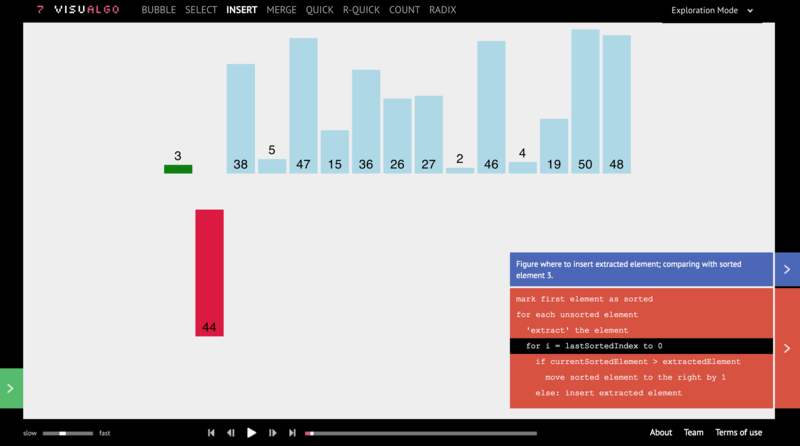 Go to VisualGo and check out insertion sort. So I've shown you two quick examples on sorting in Swift, thanks to the amazing book that I consult, Swift Algorithms & Data Structures. In the next article, I will go through working with Linked Lists.